Understanding Insight’s propagator can help you get great results in record time. As a waveform propagator, it evaluates much more than a single event, it uses the local waveform in a window. The settings can have a big impact on its behaviour! Repeat, picking the strongest correlation each time. 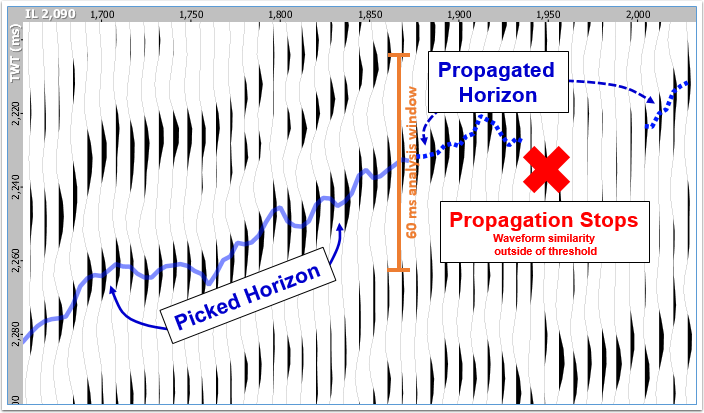 When comparing neighbouring waveforms, Insight’s propagator will look in every direction and dimension, even across offsets or angles in gathers! Also, Insight’s waveform propagator works best in the time domain. If a velocity model is available for depth conversion, Insight automatically converts depth data to time while it is propagating. To improve your results, try adjusting the waveform size with the Window Length, choose an Allowable Shift that allows for the observed dip in the event. You can find out more of the nitty-gritty details on the propagator in our online manual: See How it works (Propagator).